Once upon a time there was a Kingdom, a magical Kingdom, where trolls didn't exist, and all Thameslink trains not only ran, but ran on time without skipping stations (told you it was fiction). In this Kingdom public transport ruled ok, and the car was seen as an unnecessary commodity for town and city dwellers. Only those living in the countryside were permitted cars, and even then they had to be left on the outskirts of towns or the nearest public transport hub. You see previously in thie Kingdom the car was God. No one could reasonably manage without one except in the really major cities, public transport was spasmodic, fractured, and poorly financed and distributed. Instead of being for the people it was for rich businessmen who had few feelings for those who relied on public transport to get around. The government of the day were weak and feeble, and couldn't even roll out a new train timetable properly, or ensure that the local people had enough money to provide essential bus services. It was a sorry state of affairs, with much sadness and discontent throughout the land. The future of public transport did indeed look bleak. Then one day a man of vision had an idea. Wouldn't it be great, he said, if people were less reliant on cars. What if public transport was so good, reliable, affordable, safe and convenient that it was the first choice for the people. But that man of vision was scorned by those who ran public transport at the time. You're living in the past, they said. You just want re-regulation and to deny our shareholders their dividends. Anyway, remember how bad it was when everything was nationalised? 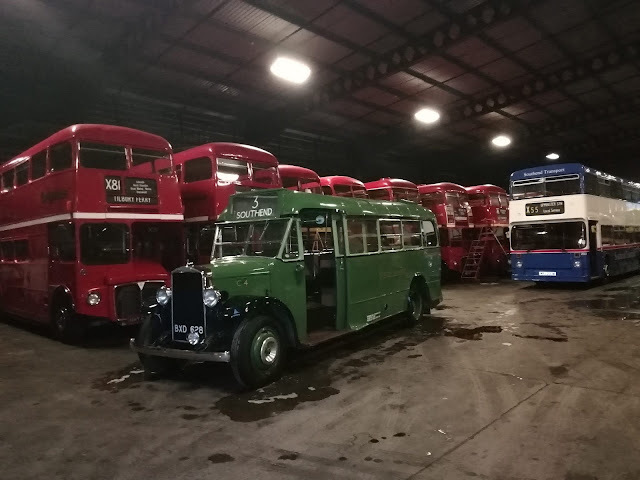 Well, said the man of vision, everything started earlier, finished later, most bus routes had a Sunday service, relief buses were often needed, and they were used in far greater numbers than now. If the people in power really wanted to change attitudes and how the Kingdom moved its people around it could, indeed, be done, but over a long period of time. Rome wasn't built in a day, let alone an integrated transport system so appealing to the people they ditch their cars and habits of a lifetime. The Kingdom is reaching total gridlock. People are spending hour after hour in traffic jams. That is because buses are stuck in the same traffic, and trains are wholly unreliable. To get people out of cars there needs to be a complete change of attitude in how the entire transport system is structured, managed, operated, and used. It requires huge investment in infrastructure for new tram lines, busways, bus lanes, cycle paths, well lit and secure walkways, new rail lines, including re-opening those closed in the dark times. "You pillock", the powers said, "how are we expected to find that sort of money, and how would we get it back?" "Let me ask you this", the man of vision replied, "how many man hours are lost to traffic congestion, or late trains?" "How many overseas investors hesitate to invest in our Kingdom who would be persuaded thus if our Kingdom moved around smoothly and efficiently"? "How many other Kingdoms would seek our advice and skills to help their own transport systems?" "You may not see an immediate return on your investment, but over time, with vastly improved efficiency, the benefits will reap rewards". The powers paused, and invited the man of vision to continue. He explained that you couldn't just order people out of their cars without decent alternatives in place, so the period of transition would be tricky and expensive, but the long term implications for future generations would justify the expense. The first thing was to simplify the existing public transport system. The multitude of different fares, having to pay multiple operators on one journey, and time restrictions were putting off the people from using the system. So you have to make public transport attractive financially, and the car seem an expensive burden. The man of vision proposed a national system based on the already successful Oyster card system in the Kingdom's capital. A national transport card that would be valid on all buses and trains in the Kingdom. On buses once you had paid the initial fare you would not be charged for any further journeys taken within an hour. There would be a maximum charge per day, week, month and year. The same would apply to trains, with discounts made for off peak travel, and journeys made avoiding the busiest areas. There would be no advance fares, although journeys on long distance trains could be paid for in advance to reserve a seat. All stations would have a connecting bus service serving the local community, which operated from first train till last. Buses would be reorganised according to the local demographics. In towns bus lanes would be rigorously enforced, with unauthorised parked vehicles confiscated and sold, and large fines for those driving cars in them. Local town services would remain largely as they are now, with frequent services from housing estates into town, connecting with longer interurban routes. These interurban routes would be faster, more direct, using high specification vehicles. They would be fed by local feeder buses serving rural communities, linking up with the trunk routes at dedicated hubs, which would have indoor facilities for passengers to wait in warmth and shelter. These hubs would also have substantial free carparks to encourage people to leave their cars outside of towns, thus helping to alleviate congestion. The buses would run from early morning to late evening, giving no reason for the people not to use them due to time constraints. That sounds all well and good, said the powers, but say we do what you suggest, pour billions into this transport system and the people still won't use it? The man of vision smiled, and said they will use it, if it pays them to. Once the infrastructure is in place ban all cars from town and city centres. Place a tax on daytime deliveries to stores, making deliveries at quieter times more attractive. Allowing public transport to move is key. Once the people see it is the easiest, fastest and cheapest way to get around they will use it. Make the annual cap on fares the same as annual car insurance and road tax combined. The powers gasped. Are you having a laugh mate, they said! We'll lose billions! Actually, the man of vision said, you won't. Encouraging and allowing people to move around the Kingdom cheaply will mean they go out more and spend their money in different ways, supporting local industry rather than online retail giants, so your coffers will just be filled by different means. The powers, not to be outwitted by the man of vision, pulled the ace from their sleeve and said "hang on, pal, the transport system is overcrowded enough anyway in parts of the Kingdom. If we make it cheaper we just won't cope with demand. The man of vision conceded that to begin with that may well be an issue. But he assured the powers that once the people saw bus lanes were kept clear, and congestion was eased they would transfer from rail to bus for shorter journeys, therefore reducing overcrowding on the trains while the new infrastructure was being built. He continued to say that if all new road projects were cancelled, and the money put into new railways, both new routes and dualling existing lines to increase capacity in 10 to 15 years we could have a world class system. Then we could start banning second car use at weekends, for example, and doubling fuel duty for those living in areas where a car is deemed unnecessary - smart technology would be able to detect car registrations and adjust the pump price accordingly. In short, make car use as unattractive as possible without penalising those for whom it was essential. So who would operate these services, asked the powers. You would, said the man of vision. A national public transport system should be just that, only you would have regional operating centres who would use their local knowledge to tailor services for their individual area's needs. 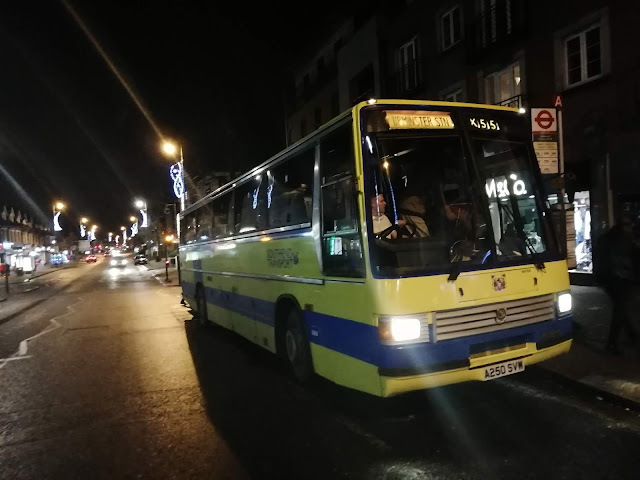 If any other operator wanted to start a service up in addition to the existing one they would be welcome to, on the understanding that the existing service was not compromised or reduced in any way, and the new operator accepted the national transport card. So what you're saying, the powers clarified, is if we build this integrated, revolutionary transport system it would considerably reduce car use, improve traffic and passenger flow in our towns and cities, which in turn would improve air quality and people's health, saving our health service money too, would get people out and about more, in comfort, to spend their money, would entice foreign investment in the country, provide increased employment to those in the transport industry, whose wages would be attractive enough to make it a serious career choice, and we'd be making a better Kingdom for our children and future generations? It seems to good to be true! Then the man of vision woke up, realised it was all a dream, that no one would ever take such a scheme seriously, that he was still 6 miles from the nearest bus service, and that the traffic to get into his nearest big town would be as bad as ever. He sighed, rolled over and went back to sleep to dream another impossible dream. British Rail Or Not British Rail? How many of us had a train set when we were young? How many of you still do? Did we all dream of running real trains instead of model ones? I mean, how hard can it be? Greater Anglia announced this week that they are scrapping First Class on all its trains except Intercity on 1st Jan 2020. On the whole this has been warmly received as it should free up an additional 20% of standard seating on the new Aventra trains. Well, not exactly free up as they are not being built with First Class anyway! Compared to if they were, I guess. But whose decision actually was this? Abelio announced it, but are they scrapping it because they have been told to? Southeastern gave a clue to that last night, when they directed people asking about the future of First Class on Southeastern to the new Franchise details. The announcement of who is to operate the new Southeastern Franchise has been delayed, and I think I can see why - the document is VAST!! Anyway, after a lot of searching I finally found the relevant paragraph regarding the future of 1st Class on Southeastern. It says "The Department requires a Franchisee that will remove First Class accommodation on all Passenger Services within 18 months of the Start Date. " So it's not the operator's choice, but a requirement of the franchise agreement, as directed by the Government. In fact, the entire operation is dictated by the franchise agreement. You wouldn't believe how complicated it is to say "run a few trains on time". I would also suggest that to understand every term and condition you would need one of the most highly trained and boring lawyers in existence, because to read through the "Invitation to Tender" makes Stephen Hawkins' A Brief History of Time look like Dear Deidrie! It ultimately leads to one question, a question as vast as the document itself - who, who in their right mind would want to operate a franchise so detailed and demanding it may as well say how many times a minute you can breathe! The railway press are at pains to tell us ad nauseum that the Train Operating Companies don't make a huge profit. So why do they do it? Are they masochists who enjoy getting the stick every time something goes belly up? I cannot think of a more Hellish way of doing things. But the railways are privatised, you say - it's what we are told. Well yes I thought so too, but they're not. They are subcontracted. That's all it is. Subcontracted to operators who pay the government to do the government's dirty work. You've got to hand it to the government it's brilliant for them! They still get to call all the shots, from timetables to the seat qualities to train lengths yet the operator gets all the blame. Sir Humphrey pulled a blinder there! I honestly don't know if my respect for the operators has gone up or down after reading that Invitation to Franchise. It certainly seems no decision is actually theirs, but at the same time who, in their right mind would enter into such an agreement unless there is more money than we know about, and after recent bailouts for Abelio and Virgin I'm not sure there is. Anyway, if you're stuck for something to do over the next few days - not much going on I know - take a look at this Invitation to Tender. It might make you look at our railway industry in a different light. British Rail? Still alive and kicking I think, and re-nationalisation would change very little except the government having to put its own name to things, instead of the franchisee whipping boys. You can read the document here. Speaking of train sets do you remember the excitement of getting a new loco, carefully taking it out of the box and laying it on the tracks, ready to go? Sadly that doesn't happen with real trains, and despite the 4th Class 755 Flirt arriving at Norwich yesterday it will still be a good 6 months or so before they enter service. Greater Anglia have helpfully put out a post explaining why, which you can read here. Secondly Stagecoach have announced they are pulling the plug on their US operations, which includes Megabus. They have taken a big hit too financially. I'll be interested to know what our resident North Carolina reader, Norfolk Boy thinks of this! This will be the last post before Christmas, but over Christmas I'll be posting my fantasy Utopian Transport System post, which I'm sure will have the trolls frothing at the mouth! So to all my genuine readers thank you for another year, hopefully there will be a bit more to write about next year, and I wish you and your loved ones a great Christmas, and a blinding 2019. That title is unashamedly pinched from the utterly brilliant Yes, Minister, which is still as relevant today as it was 35 years ago, except with fewer mobile phones. However, the premise is still the same, in that the public are only told what the powers at be think we need to know, rather than what we have the right to know. In no area is this more blatant than our railways. Passengers are kept in the dark about everything from where profits go to, to what causes points to fail. Fares rise year in year out, and the same promises are made year in year out, that the rises are needed to fund investment. Yet nothing ever seems to improve, and, this year in particular, services in some areas have declined to a level so unacceptable it's a miracle civil war hasn't broken out. Two years ago I wrote a post on Driver Only Operations - see here - and nothing has changed. The public want guards, the RMT members have sacrificed thousands striking to protect the role of the guard, yet the stalemate exists. And still no one from within the rail industry has stepped into the spotlight to explain to everyone WHY they want to take guards off trains. Obviously it's to save money but no one has the guts to admit it. It's because they don't think we need to know. One of my greatest triumphs as a guard was seeing the penny drop in a passenger's eyes when I pointed out to her that leaves on the line look a lot different to leaves on the tree. A black, oily difference to be precise. That was 19 years ago. What has happened since? There is still mocking derision at the leaves on the line excuse as there was then. Yes, various operators and Network Rail have put out videos trying to explain, but the people who need to understand aren't the people watching Network Rail videos. The media are a joke. Mainstream media are so happy to bash the rail industry they will print anything, true or not, in order to make headlines. The Woodland Trust ignore pictures of trains hitting fallen trees which could have killed drivers to bleat on about Network Rail clearing lineside trees as an affront to society. The rail media are so far up the industry's backside the day they come out on the side of the passenger will be the day there isn't a single signal failure anywhere in the UK, so who does the passenger complain to? Where is their voice? Who is actually there for them, explaining things so they understand? If you want a job from Hell take a job on the Twitter feed of a train operator. Those poor sods get it in the neck morning, noon and night and my heart goes out to them. They have a list of stock responses they have to use, most of the time are obviously not privy to relevant information themselves, yet are the first port of call for the passengers' ire and frustration, quite often abusively. It's not their fault a train has stopped in the middle of nowhere, but they are the only outlet to vent frustration, especially if the only on board member of staff is the driver. So how can this long standing status quo be altered? What can be done to help and educate the passenger at the same time? How can the same passenger be told what they have the right to know rather than what others decide they need to know. As Sir Humphrey would have said "If you start telling people what they want to know, rather than what they need to know, then they'll know, and start asking awkward questions we don't know the answers to." The industry doesn't help itself. Take fares, for example. They are so damned complicated Einstein would have been confused. To give you an example I was given only this week. A friend of mine was at Ebbsfleet International station, wanting an off peak return to London, going out one afternoon and returning the next. Can't be done - an off peak return has to be the same day, so two singles totalling £36 was the cheapest option. Except it wasn't. The helpful ticket clerk realised that if you go in and out of London off peak returns become Anytime returns which are valid for a month, so sold my friend an Anytime return to East Grinstead for £24.60. It is examples such as that which drive customers crazy, yet nothing is ever done. So a voice is needed which takes the side of the passenger, explains things they ought to know, have the right to know, and holds the right people to account. I suggested to the Association of British Commuters earlier in the year that a publication was needed to do just that, which would be read by as many passengers as possible. A weekly or fortnightly paper, given out free at stations, like the Metro or Evening Standard, that was on the side of the commuter, yet dispelled a few myths, published good stories about the railways too, but above all told the truth. I suspect advertisers would fall over themselves to be seen in such a publication, and there would need to be regional variants in time. It would also force the industry to be more transparent and honest. If tocs saw thousands of copies of "The Commuter" being recycled from their trains every week or two it might make them realise that the passengers now knew what they didn't want them to know and that meant acts had to be got together, and fobbing off was no longer viable. So my plea to the Association of British Commuters is this. You are doing an amazing job in highlighting what you do, but a publication would reach millions more, and force people to give answers and improve things. We've seen in France recently what can happen if the public pull together. The railway passengers cannot pull together unless they know what they are pulling together over, and to do that they need to know what currently they don't know! I want to be a part of this, and I have no doubt whatsoever it would be a winner, particularly for the poor passenger, who is still in the dark because what they think they know is only what others think they need to know, not actually what they need to know, or indeed have the right to know. Know what I mean? I'm sure everyone has a few dates during the year they look forward to. Could be anything from a birthday, to Wimbledon, to Trooping the Colour, to First Night of the Proms, to the new fishing season starting. For me, December 1st 2018 had been top of my "looking forward to" list since December 2nd 2017 when I attended my first Ensignbus Running Day. I had basically ordered Tim to keep the day free so he could come too as I wanted to share the experience. You see there are Running Days and Running Days. There are Running Days which involve a 10 min trip round an industrial estate or big field when you don't know what's going to be doing what or when, and there's this Running Day. 3 routes, 2 of which are roughly 3 hour round trips, the other one being nearly 2 hours. Not only that but you know what vehicle is going to be on which run so you can tailor the day to your own needs. Buses running from 0900 - 1930 and it costs a tenner. 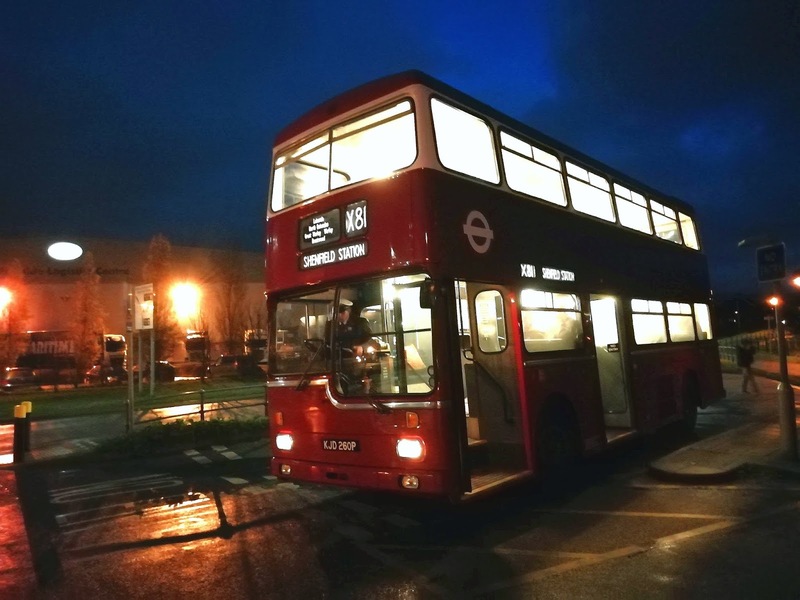 Add to that it's becoming the bus social event of the year too, and you have the recipe for a perfect day. So at precisely 0533 we set off from Blog HQ for the drive down to Purfleet. 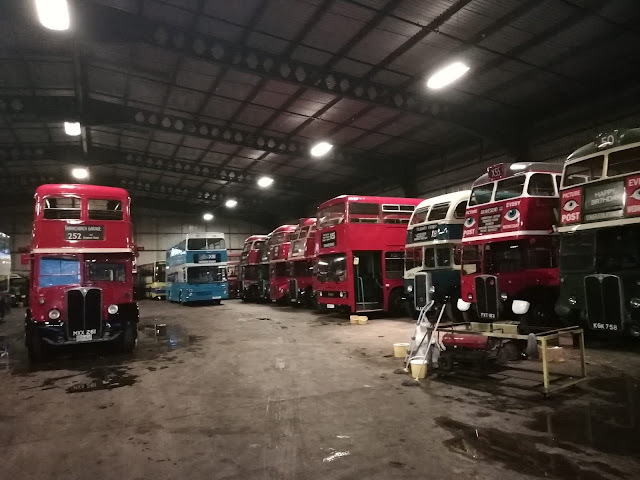 Although the weather forecast wasn't great there was still an air of anticipation of what was to come, which only heightened when we arrived at Ensignbus' depot in time to see all the stars of the show still tucked up but blinded up ready before action. 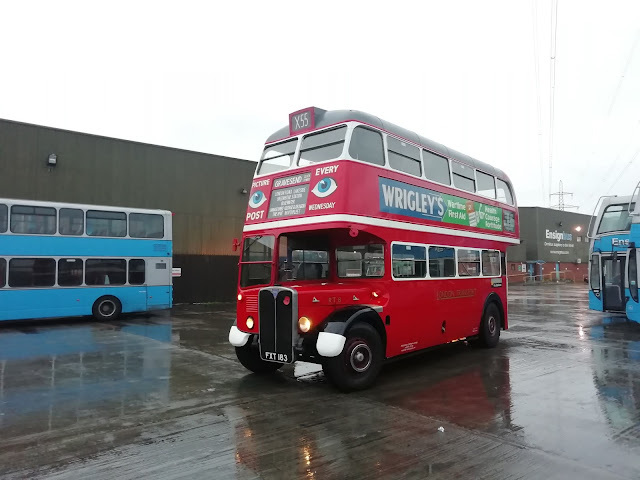 Despite the now falling rain the atmosphere in the depot was one of excitement and cheerfulness, and we couldn't wait for the day to get going. I had decided that if nothing else happened, Tim was going to get the "RT driven by a Newman" experience, plus I wanted him to see RT8, with all its wartime décor. Ross Newman was only taking it out for one trip so that was the obvious first choice. Empty to Upminster then the X55 to Gravesend via Lakeside, Dartford Crossing and Bluewater. 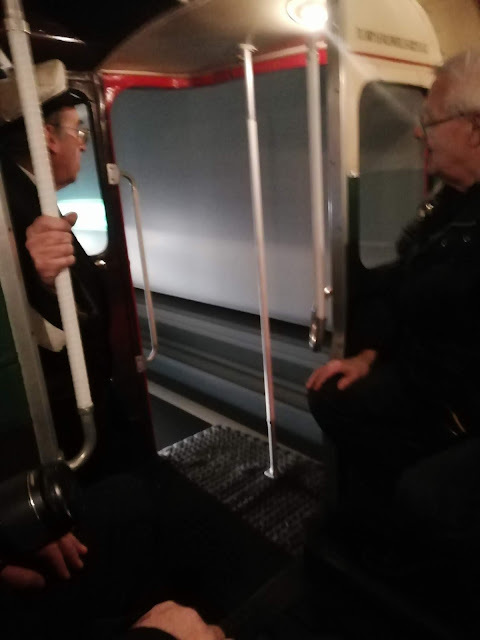 Rain shelters really don't come much better, and when the conductor is a self confessed blog reader it makes it even better - great to meet you, Bob! Ross didn't let us down - 2 hours of brilliant driving and my that old girl is in incredible condition for her age - the RT that is, not Ross! 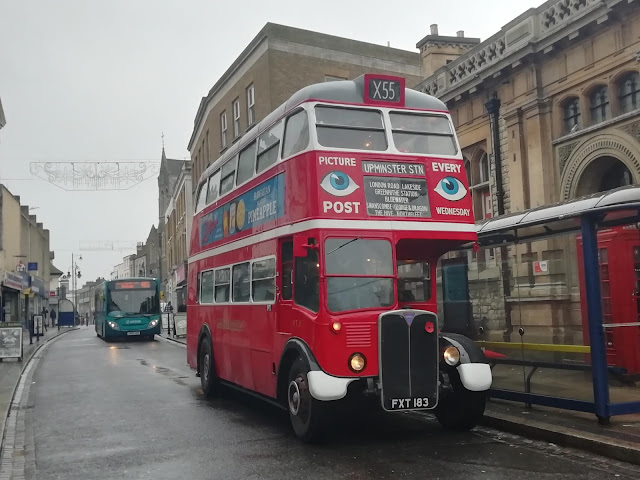 We left her in Gravesend town centre for a pit stop before our second bus of the day, with a VIP driver. One of the people I wanted to see during the day was Martijn Gilbert, former Reading Buses supremo, now MD at Go North East. It was Martijn's birthday, and one of his regular birthday treats is to drive on the Running Day. You may remember last year he broke the DMS, which has supplied a year of constant mickey taking. I'm pleased to report he survived the day intact, and his first bus was the Southend Transport Leyland Fleetline. A new bus for me, and a type of bus familiar to my youth. One of the real joys I've gained from this blog is the people I've got to know, and it seemed totally appropriate that on Martijn's bus I should meet Tom Bowell for the first time. Tom and I have been communicating on Twitter for some time now, not always in complete concordance, but after Martijn introduced us at Bluewater we clicked. Tom is a young man with a great future in whatever he chooses to do. Heavily involved in politics in his native Croydon area, Tom is also passionate about buses and public transport in general, and has recently written articles for local media regarding proposed TfL alterations to bus services in his area. I could have chatted to Tom and his two companions all day, but there were other things to do, so we left them at Upminster as a rather special guest was soon to arrive. Buses are sometimes like buses - you wait 35 years to go on one then you get it twice in a month. 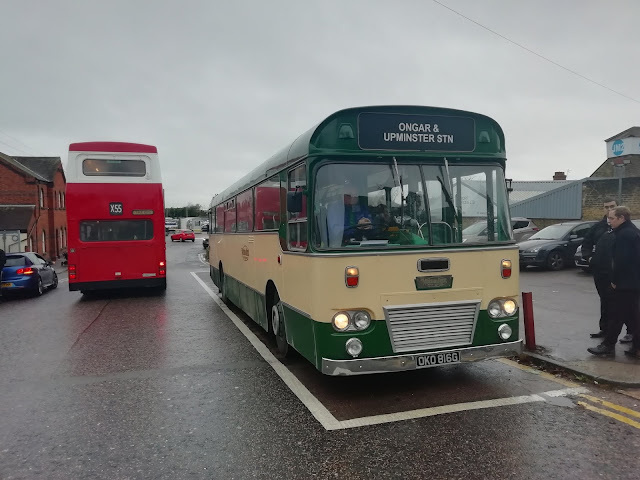 This was the case with Seaford & District's ex Maidstone & District Leyland Leopard 2816. I won't go on too much about it as I did that when I travelled on it a few weeks back on Tube Strike day. 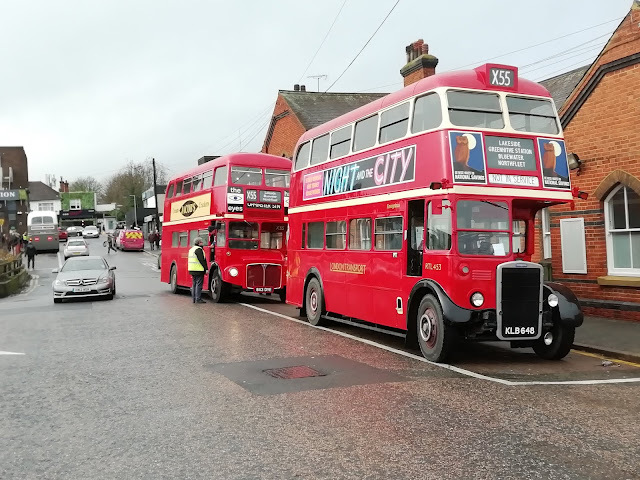 Suffice to say she looked great, sounded great and the journey to Ongar on the X21 was made even better by chatting to Alisha, a young lady who is simply the Google of London buses. Female enthusiasts are rare, but Alisha makes up for that. Her knowledge of the London scene is unrivalled, and I'm busy trying to persuade her to write a regular article on the London scene for us. So good to see you again, Alisha, and I will keep nagging. We left the Leopard at Brentwood High St to catch the third of the three routes, the X81 to Tilbury. At this point we had no idea what bus we would be getting, basically the first one to turn up, so when I checked only to discover it would be a certain Metropolitan Scania we knew the bus Gods were smiling on us. Again, I'd only been on her a few weeks ago, but that is one bus I would travel on day in, day out with no complaints and never getting bored. 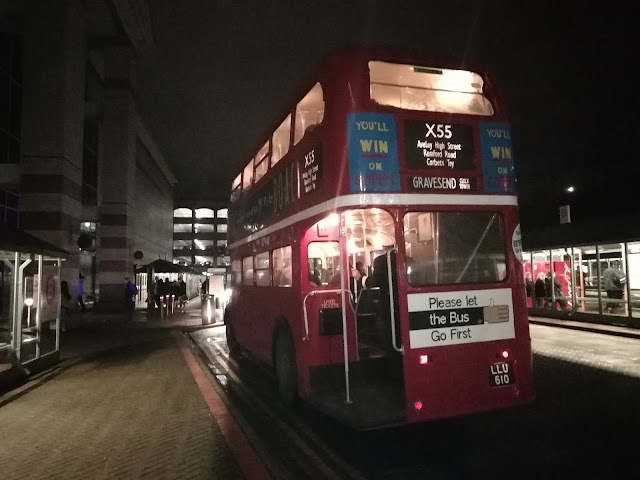 So ahead of its time, giving a ride modern manufacturers must be jealous of, I reached the conclusion that MD60 is my favourite bus in the country. Beautifully cared for by Paul, who it's always great to see, I get a thrill from riding that bus that I get from no other, and there's plenty of competition! At Tilbury I got what I think is my photo of the day. Despite growing up in North Kent I had never been on the Gravesend - Tilbury ferry. Never even crossed my mind and I'm kicking myself. What a useful connection and I will be back. Unfortunately it was too dark to get a decent photo by time Tim and I were there as the lighting both sides was minimal to say the least! Back in Gravesend we had a choice. I wanted to get RT3251 driven by the Father of the bus industry, Peter Newman, before meeting up again with Martijn for the journey back to the depot, but another surprise was in store first. Again, totally unplanned by us, the ex Southend Transport Astromega arrived, looking superb, and driven by another guest driver, the MD of Lothian Buses, Richard Hall. It was after sinking into those sumptuous seats and taking in the heat, that we realised we were going to get an unexpected bonus. 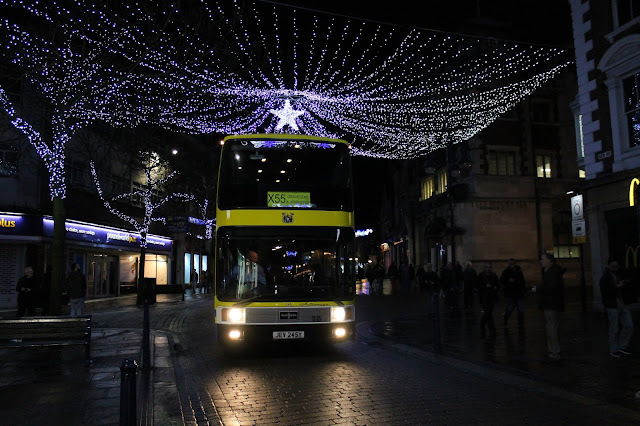 Gravesend High St has long been popular for its Christmas lights - it's where Dad always took us when I was a boy - and now pedestrianised apart from buses, the perfect photo opportunity was given to us. I thought I got some good ones but Tim took the prize with this stunner that would grace any Christmas card. 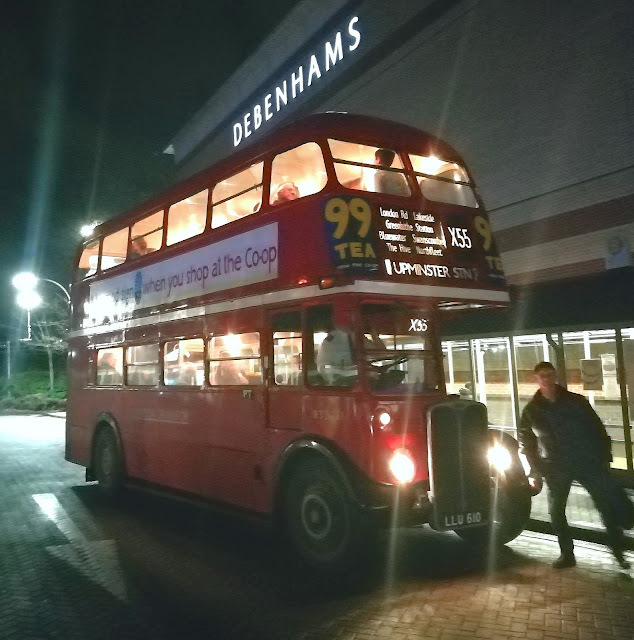 We stayed with the now rather late running Astromega to Bluewater, and 5 minutes later Peter Newman arrived on his beloved RT3251. I was delighted to see last year's conductor with him, and I made sure Tim was in prime position for the journey through the Dartford Tunnel on an RT, which is an experience everyone should have at least once in their lifetime! Peter, who I'm convinced becomes 10 years old again when he's driving that RT, gave an exhilarating ride, and it was with reluctance we left him at Upminster, as the ride back to the depot would have been something else. However, there was one last treat, and something completely different. I well remember the Duple Laser bodied Leyland Tigers of the early 1980's. Absolute beasts of their time, and I loved them. So did Martijn Gilbert, who used to travel on them as a boy, and had reverted to 10 years old himself when given the opportunity to drive one of the very coaches of his boyhood. 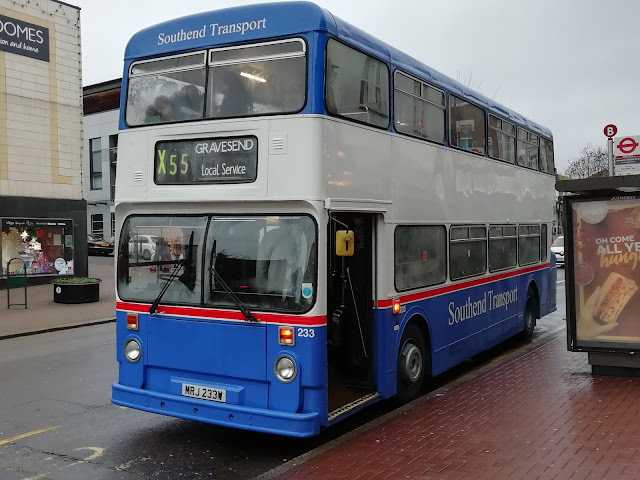 The Southend Transport Tiger was lovely, Martijn was clearly in clover, and apart from anything else it gave me half hour with one of the most respected bus mangers in the country, an opportunity that doesn't come around that often, especially with him now based in Newcastle! It put the icing on the cake of a day that left me with not much voice left, but totally fulfilled. One sad thing to note - a few mins after we got off the Leyland Leopard a stone flew up and smashed the offside windscreen. Thankfully there were no reported injuries. Such a shame, and I hope a new one is sourced soon as there can't be too many 1968 Leyland Leopard windscreens sitting on shelves. I have only covered what Tim and I did. There was so much more, and so many more vehicles. If anyone wants to send in their pics of the day so I can do a supplementary post that would be great. My thanks to so many people - Ross, Steve, Peter and especially Paul Dickson at Ensign for once again making me feel part of the Ensign family, to Tom, Alisha and numerous others from all areas of the industry I met on the day, to Martijn for being just a nice guy, and to Tim, for not taking offence when I frequently deserted him to talk to others! Roll on December 7th (I presume) 2019! Tim wanted to say a few words so I'll leave the rest to him. I'm hoping to do a lot more with Ensign over the coming months, including their own bus operations so watch this space. Hello It's me! I will admit it was an early start from mine and rather late when I got back to bed but it was worth it. The sheer scale of the operation was a thing to see and enjoy, plus the spectacle of that first bus to Upminster which was totally packed 30 seconds after arriving. I saw so many people hopping on and off just to get the bus they wanted for a tick in the book, and to be honest I was bowled over by the sheer numbers of enthusiasts that had turned up. Martijn was over the moon that a man from Newcastle had travelled all that way and was on his bus too! 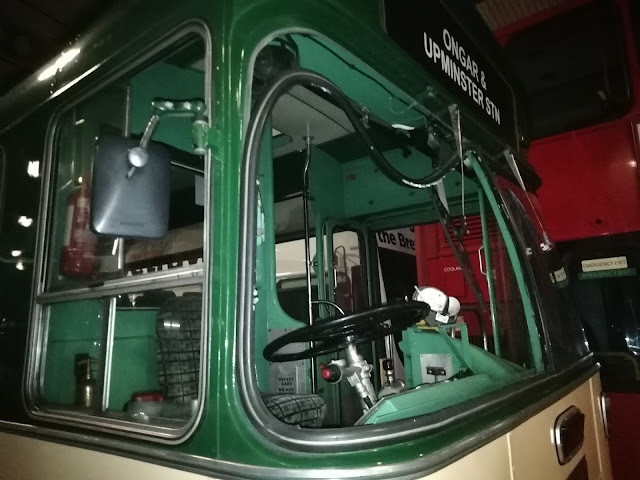 I also freely admit as much as I like the old buses I do have soft spots for the Astromega and the Tiger which I was very happy to get 2 good runs on. I really felt welcome too, it was such a friendly, happy day that was my first and hopefully not my last. Thanks for the invite Steve and here's to next year! !